Dietitians have an important role in helping people meet recommendations for dietary fiber (which call for considerably more fiber than is consumed by most Americans) and guiding them to consume it from a variety of foods to maximize the carbohydrate's range of benefits. Evaluating dietary fiber's potential to promote health is especially challenging. 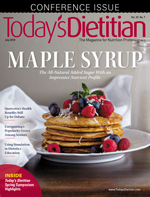 Observational studies link high dietary fiber intake with health benefits such as reduced risk of colorectal cancer, CVD, and type 2 diabetes.1,6-8 However, these studies can't establish cause and effect, and it's difficult to determine how much benefit relates to dietary fiber vs other health-promoting nutrients and phytochemicals contained in high-fiber foods. Therefore, most randomized controlled trials (RCTs) turn to isolated fiber supplements. Gel forming is viscous fibers' critical feature for reducing LDL cholesterol. As water is reabsorbed during passage through the intestines, bile is trapped by gel-forming fiber and eliminated with the stool. This reduces the bile acid pool normally available for reabsorption, increasing clearance of LDL cholesterol from the blood for liver production of the bile acids needed for digestion. In addition, gel formation also is critical for improved glycemic control. Increased viscosity slows digestive enzymes' degradation of nutrients and thus slows glucose absorption, reducing peak postprandial blood glucose after a meal.1,5 Glucose absorption slows, but this doesn't reduce the total amount of carbohydrate absorption. "Bulking" fibers create larger, softer stools. Most often this is viewed as a way to help prevent or relieve constipation. However, this role might be better viewed as stool normalizing, since it also can help firm up loose or liquid stools.5 In addition, it may provide long-term health protection by speeding passage of waste through the gut, diluting potential carcinogens, and reducing exposure to the colon. Dietary reference intakes for dietary fiber are based on evidence that fiber reduces heart disease risk. The basic recommendation calls for 14 g/1,000 kcal.4 This has been translated into Adequate Intake recommendations of 25 g/day for women and 38 g/day for men up to age 50, and 21 g/day for women and 30 g/day for men over 50. Adequate Intakes for youth range from 19 to 38 g/day based on age and gender. Theoretically, each type of fiber provides mechanisms that could play a role in reducing risk of colorectal cancer. Risk of other cancers also may be reduced by fibers that affect hormone levels, inflammation, and carcinogen exposure. Thus far, however—amidst challenges in defining and assessing consumption of total and specific fiber types—evidence doesn't clearly tie fiber to reduced risk of other cancers. Dietary fiber is found in plant foods such as grains, vegetables, fruits, legumes, nuts, and seeds. In general, the least-processed choices are those that provide the most fiber. Foods are always a mixture of several different types of dietary fiber. However, many high-fiber foods are better sources of some particular types of fiber than other types. 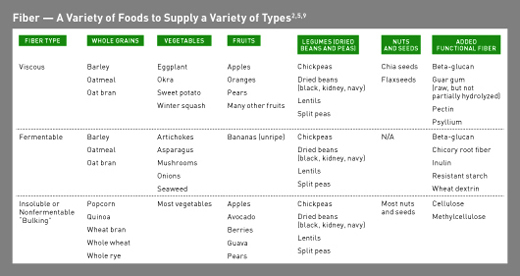 Table 1 illustrates why it's important to eat a variety of fiber-rich foods to obtain the widest range of potential benefits. Current food labels base content information on the DV of 25 g dietary fiber. However, as part of the update on food label format, the dietary fiber DV will be listed as 28 g, based on the recommendation of 14 g/1,000 kcal. The deadline for compliance has been postponed, but many food labels already have begun to use the updated DV. If fiber intake for a particular benefit is higher than someone can reach with basic healthful eating choices, fiber intake can be increased with foods containing added functional fiber or a fiber supplement. In advising patients about these options, it's important to explain that choices should be made with recognition that different types of added or supplemental fiber have different effects. Another essential message is that such options provide health benefits specific to those fibers, whereas high-fiber foods also supply a wide range of protective nutrients and phytochemicals. Working toward an overall healthful eating pattern should remain the primary strategy. 1. Dahl WJ, Stewart ML. Position of the Academy of Nutrition and Dietetics: health implications of dietary fiber. J Acad Nutr Diet. 2015;115(11):1861-1870. 2. Slavin J. Fiber and prebiotics: mechanisms and health benefits. Nutrients. 2013;5(4):1417-1435. 3. Fuller S, Beck E, Salman H, Tapsell L. New horizons for the study of dietary fiber and health: a review. Plant Foods Hum Nutr. 2016;71(1):1-12. 4. Institute of Medicine, Food and Nutrition Board. Dietary Reference Intakes for energy, carbohydrate, fiber, fat, fatty acids, cholesterol, protein, and amino acids: chapter 7: dietary, functional, and total fiber. https://www.nap.edu/read/10490/chapter/9. Published 2005. 5. Lambeau KV, McRorie JW Jr. Fiber supplements and clinically proven health benefits: how to recognize and recommend an effective fiber therapy. J Am Assoc Nurse Pract. 2017;29(4):216-223. 6. World Cancer Research Fund; American Institute for Cancer Research. Diet, nutrition, physical activity and cancer: a global perspective. https://www.wcrf.org/dietandcancer/about. Published 2018. Accessed June 14, 2018. 7. Threapleton DE, Greenwood DC, Evans CE, et al. Dietary fibre intake and risk of cardiovascular disease: systematic review and meta-analysis. BMJ. 2013;347:f6879. 8. Yao B, Fang H, Xu W, et al. Dietary fiber intake and risk of type 2 diabetes: a dose-response analysis of prospective studies. Eur J Epidemiol. 2014;29(2):79-88. 9. McRorie JW Jr, McKeown NM. Understanding the physics of functional fibers in the gastrointestinal tract: an evidence-based approach to resolving enduring misconceptions about insoluble and soluble fiber. J Acad Nutr Diet. 2017;117(2):251-264. 10. Ho HV, Sievenpiper JL, Zurbau A, et al. A systematic review and meta-analysis of randomized controlled trials of the effect of barley β-glucan on LDL-C, non-HDL-C and apoB for cardiovascular disease risk reduction. Eur J Clin Nutr. 2016;70(11):1239-1245. 11. Ho HV, Sievenpiper JL, Zurbau A, et al. The effect of oat β-glucan on LDL-cholesterol, non-HDL-cholesterol and apoB for CVD risk reduction: a systematic review and meta-analysis of randomised-controlled trials. Br J Nutr. 2016;116(8):1369-1382. 12. Wanders AJ, van den Borne JJ, de Graaf C, et al. Effects of dietary fibre on subjective appetite, energy intake and body weight: a systematic review of randomized controlled trials. Obes Rev. 2011;12(9):724-739. 13. Rebello CJ, O'Neil CE, Greenway FL. Dietary fiber and satiety: the effects of oats on satiety. Nutr Rev. 2016;74(2):131-147. 14. Silva FM, Kramer CK, de Almeida JC, Steemburgo T, Gross JL, Azevedo MJ. Fiber intake and glycemic control in patients with type 2 diabetes mellitus: a systematic review with meta-analysis of randomized controlled trials. Nutr Rev. 2013;71(12):790-801. 15. Bultman SJ. The microbiome and its potential as a cancer preventive intervention. Semin Oncol. 2016;43(1):97-106. 16. US Department of Agriculture, Agricultural Research Service. What We Eat in America, NHANES 2013-2014: nutrient intakes from food and beverages: mean amounts consumed per individual, by gender and age, in the United States, 2013-2014. https://www.ars.usda.gov/ARSUserFiles/80400530/pdf/1314/Table_1_NIN_GEN_13.pdf. Published 2016. 17. US Department of Agriculture; US Department of Health and Human Services. 2015–2020 Dietary Guidelines for Americans, 8th Edition. https://health.gov/dietaryguidelines/2015/guidelines/. Published January 7, 2016. Accessed April 30, 2018. 18. Van Horn L, Carson JA, Appel LJ, et al. Recommended dietary pattern to achieve adherence to the American Heart Association/American College of Cardiology (AHA/ACC) guidelines: a scientific statement from the American Heart Association. Circulation. 2016;134(22):e505-e529. 19. Ha V, Sievenpiper JL, de Souza RJ, et al. Effect of dietary pulse intake on established therapeutic lipid targets for cardiovascular risk reduction: a systematic review and meta-analysis of randomized controlled trials. CMAJ. 2014;186(8):E252-E262. 20. Questions and answers for industry on dietary fiber. US Food and Drug Administration website. https://www.fda.gov/Food/LabelingNutrition/ucm528582.htm#define_dietary_fiber. Updated March 1, 2018. Accessed May 9, 2018.